The American Eagle gold coin is a popular option for investors of precious metals. Depending on your goals, you may want to consider adding it to your own investment portfolio. Regardless of your unique financial strategy, the American Eagle coin could be a great option to help you achieve your investment objectives. But first, you’ll want to familiarize yourself with the two versions of the coin and how they differ. The American Eagle bullion coin was first minted in 1986, produced from gold mined in the United States. According to the U.S. Mint, the coin quickly became one of the world’s leading gold bullion investment coins. The coin features the work of two designers: the full-length figure of Lady Liberty by Augustus Saint-Gaudens on the obverse, and an eagle by sculptor Miley Busiek on the reverse. Made from gold and small amounts of alloy to resist scratching and marring, the coins have a composition of: 91.67% gold, 3% silver, 5.33% copper. Keep in mind that the face value of each coin has no relationship to its actual worth. As with all gold bullion, the value is determined by the current market price for gold, based on the coin’s gold content and weight. The American Eagle gold coin is the only bullion coin whose weight, content and purity are guaranteed by the United States government. Today, it is accepted in major investment markets around the world and is also the most widely traded bullion coin in America, according to the U.S. Mint. The American Eagle proof coin is the collector’s-grade version of the bullion. It is virtually identical to the bullion coin, except that it is minted with extraordinary production standards and an immaculate presentation. As such, it is minted in limited quantities. The limited production thus adds another factor that determines the value of the coins. In addition to gold content and weight, the value of these coins can also be increased by their overall scarcity and condition. This is why many investors and gold coin collectors choose to invest in both the bullion and proof versions. 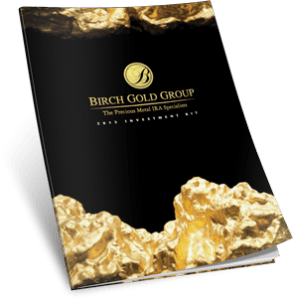 Birch Gold Group offers both versions of the American Eagle gold coin and can help you determine if they make sense for your portfolio. Rated A+ by the Better Business Bureau, we also specialize in gold-backed IRAs, as well as other precious metal assets, including silver, platinum and palladium. Learn more about your options by speaking with one of our knowledgeable specialists today. Call (800)355-2116 or request more information by filling out the form on this page.